Posted by Melissa Parks on Aug.10, 2016 17:18:49 PM. We live in a world of hyper-connectivity and so we assume that any message that we send and also receive remains in storage in our phone for us to refer in the future to our iPhone and other iOS devices. But, the fact is that there are greater chances of deletion of SMSs from iPhone and any touch devices for that matter. 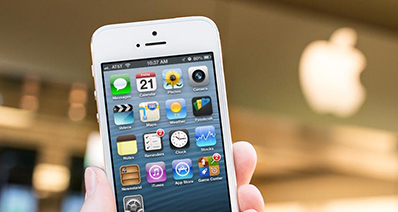 Once we delete it accidentally or when it happens due to a malware update or any other activity on the iPhone, the messages will become irrecoverable. We know that Apple states that users can recover deleted messages or other data with the help of iCloud and iTunes backup, but in some cases, restoring from backup may neither be the most applicable nor be the most advisable. It will erase your all content and settings when your restore from backup, if your backup files is too large, then the process will be very tedious and some unexpected interruptions and errors may be occurred that may result in further loss of data. What's more, Let us suppose that you've backed up your iPhone device with iTunes, but you know this backup file cannot be read or open directly, it was just saved on in your hard disk in a special format. When your device crashed due to failure upgrade or stolen, this backup can't be restored to your iDevice again, if it happens to you, all attributes and features of iTunes will be useless. In such cases, a recovery tool like TunesBro DiskLab for iOS program is indispensable to you. A newly released by TunesBro for windows Users. 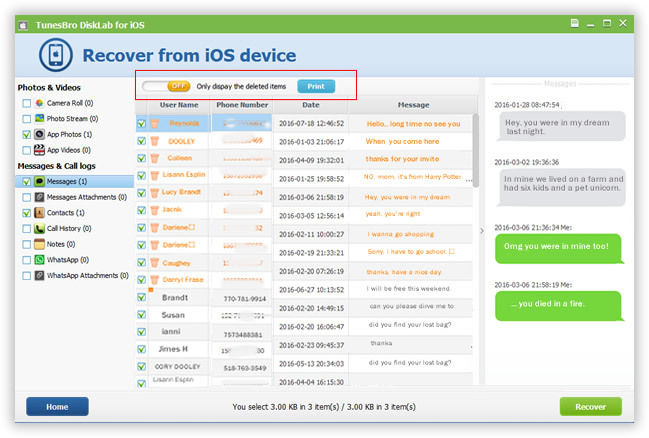 DiskLab for iOS is a safe and effective desktop application that provides more customizable approach to help users retrieve messages from iPhone, more effective than Apple's methods do. How DiskLab for iOS Works? It can deeply scan all your "already deleted" messages or other data from disk of your device, then take that data - those bits of storage location, and rearranging them to your original data and then save to your computer. Apart of direct recovery feature, DiskLab for iOS also enables you to access and save backup data including messages, photos, contacts and more... 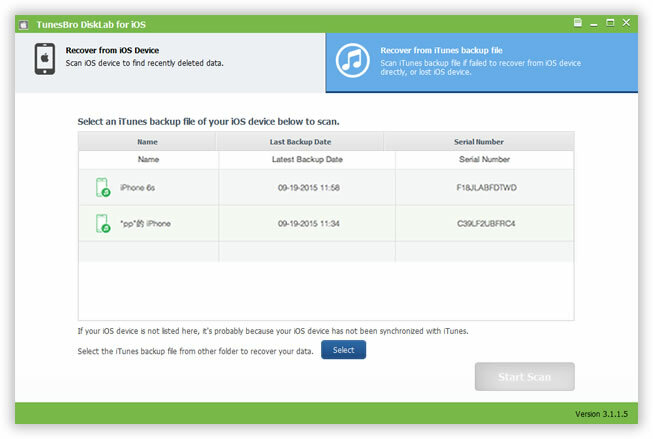 It provides 2 modes to scan and recover your deleted text from iPhone device. First of all, you need to download this program and install on a computer. Connect your iPhone to a computer via USB cable, then launch DiskLab for iOS, it will automatically detect your iPhone and display your device's iOS version. See the main windows below. Once your iPhone device has been detected, then click "Start Scan" button to let the program deeply scan your lost data from iPhone device itself. It may take a few seconds or minutes based on the size of the your data, don't disconnect your iPhone to PC or the scanning may break. After some time, assume that you've finished the scanning process, then you can see all the files will be classified by call categories like call history, contacts, message,etc. You're allowed to choose proper file of type to preview. After confirmation, just select the data you want and then click "Recover". Here, we select Text Messages to recover. 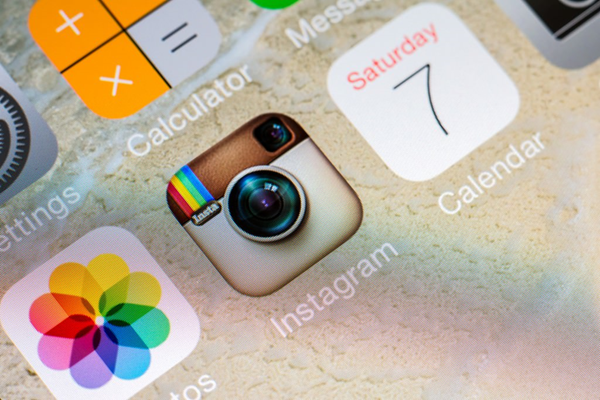 You can also follow this guide to recover deleted contacts on iPhone. If your iPhone device is not in hand (damaged or lost), you still have a chance to extract your messages from iTunes backup and save to your computer. Note: Your device need not be connected to your computer when running the program, and before performing operation "restore from iTunes backup", please be sure that iTunes is closed so as to avoid data overwriting by synchronization. After installation, run it. Choose recover from iTunes backup file option in the main window, the program will automatically detect all the backup files generated by your iTunes and lists in the program with details. 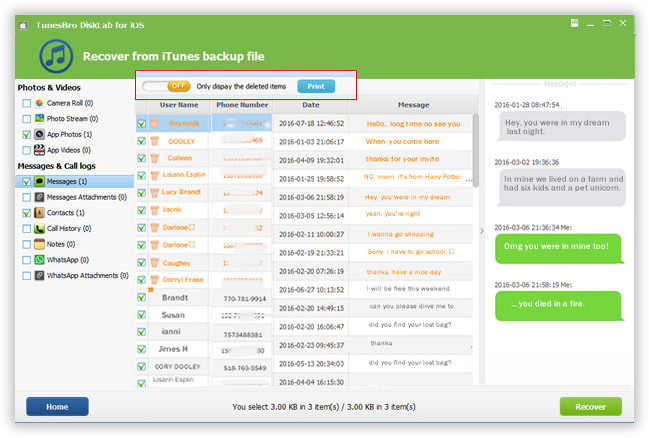 Choose one backup, Click "Start Scan" to exact backup SMS from iTunes. 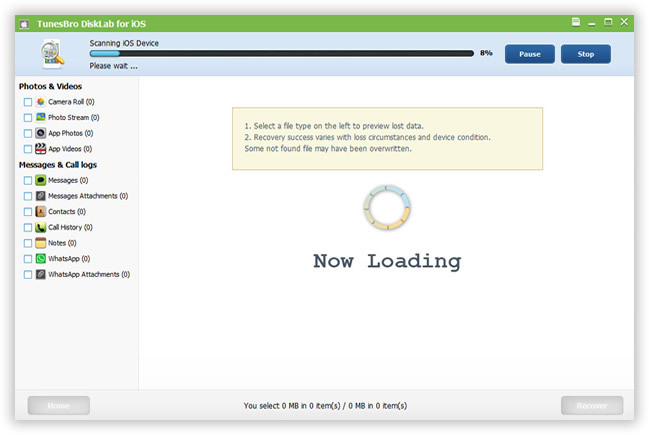 It will take a few minutes to scan your selected backup file. After that, all the contents in backup will be displayed in well-organized categories with details, you can click it to preview the messages in the program. After confirmation, choose the messages you want to restore and click "Recover" button to extract text from iPhone backup to your computer. It's a good habit to back up your device constantly on your computer in case of losing your important data. If you've already performed a sync, the iTunes backup file you made wasn't just done to be safe, it's necessary for us to move the content to a new device or extract messages to your computer. 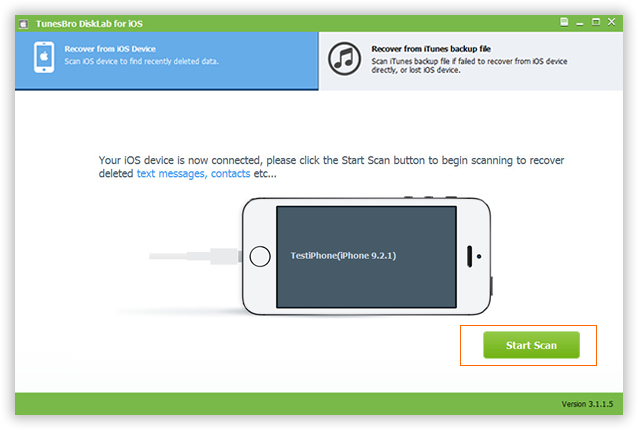 This DiskLab for iOS will help with the recovery of not just SMS, but a wide range of other data from your iPhone, iPad and iPod device. It is compatible with all versions of iOS inclusive of the latest iOS 9.x. More than anything else, the user-friendliness of this application is highly appreciable as the recovery process can be completed just in three steps. The best recovery application should help you with the recovery of data irrespective of the reason behind the loss. Regardless of whether the data loss has happened due to accidental deletion or due to an iOS update or a firmware update, system crash, restoring to factory setting or any other reason for that matter, this assurance is given in the manufacturers of TunesBro and so you can feel rest assured that you have chosen the best and dependable application to retrieve your lost text on iPhone with or without backup.